What Is IRS Form 1040, and How Do You File It? Who needs to file Form 1040? What about 1040EZ and 1040A? If you’re filing income tax as an independent contractor or freelancer, it’s time to get closely acquainted with Form 1040. Who should file it? How do you file it? Here’s everything you need to know. Form 1040 is how individuals file personal income tax to the IRS. It’s used to report your gross income—the money you made over the past year—and how much of that income is taxable after credits, deductions, and personal exemptions. It will determine the amount of tax you owe or the refund you receive. This form can handle multiple sources of income and more complicated tax situations that an independent contractor or freelancer might face. If you’re a sole proprietor, you’ll need to fill out Schedule C (Form 1040) to report income or loss from your business. If you made a mistake on your 1040 and need to make an amendment, you can do that on Form 1040X. Prior to 2019, there were different versions of Form 1040, including 1040EZ and 1040A. However, these no longer exist. 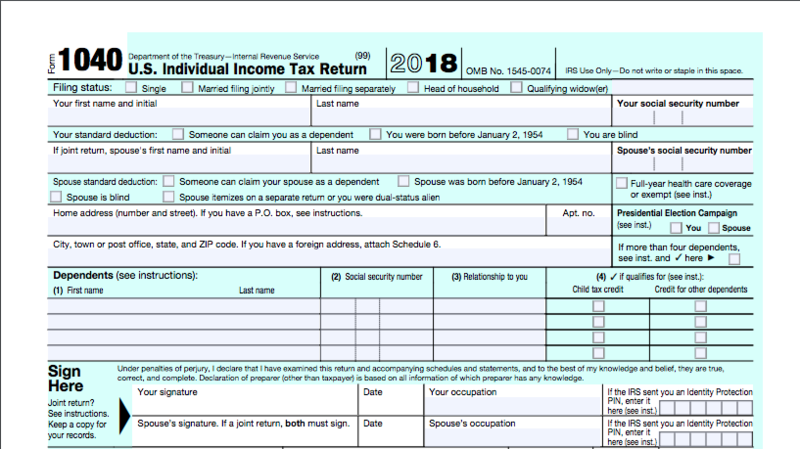 The IRS now wants everyone to use the redesigned Form 1040. If your business is a partnership, you’ll need to file Form 1065 for your partnership taxes, in addition to Form 1065. If your business is an S corporation, you’ll need to file Form 1120S for your S corp taxes, in addition to Form 1065. If your business is a C corporation, however, all your business taxes are handled on Form 1120. You’ll still need to file Form 1040, but you won’t need to report your business income there, just your personal income. Download Form 1040 directly from the IRS website or access the form via any popular tax software. The form is divided into sections where you can report your income and deductions to determine the amount of tax you owe or the refund you’ll receive. You’ll need to have other income documents like the W-2 and Form 1099-MISC available to reference, as well as any other tax documentation sent to you this year. On the first page of Form 1040, begin calculating your adjusted gross income (AGI) by reporting all sources of income you received for the year, unless it is tax-exempt. The sum of each source is referred to as your total income. As an independent contractor or freelancer, if you received a Form 1099-MISC, complete Schedule C of Form 1040 to report your taxable income. Claim deductions or adjustments from your total income to reduce your taxable income. You can itemize your deductions using Form 1040, or take the standard deduction for your filing status by completing Schedule A. After making your deductions, you can reduce your taxable income further with one exemption for yourself, and one for every dependent you claim. Taxpayers are entitled to exemptions on their tax returns to reduce taxable income like a deduction does. This is a fixed amount that usually increases each year. Subtract your exemptions to calculate your AGI, which is subject to income tax. To make sure you deduct every possible expense you’re eligible for, check out our comprehensive list of small business tax deductions. Consult the IRS Form 1040 Tax Table to determine the amount of your tax according to your taxable income. Use this to calculate what you owe the IRS, or your refund. Once it’s signed, Form 1040 can be filed online or through the mail. You’ll need to submit Form 1040 to the IRS by April 15, 2019, unless you’ve applied for an extension.